District 11 Supervisor John Avalos, with his wife Karen Zapata by his side (right), posed for a photo outside the San Francisco Department of Elections Friday following the filing of required paperwork for his re-election bid. Photos by Luke Thomas. 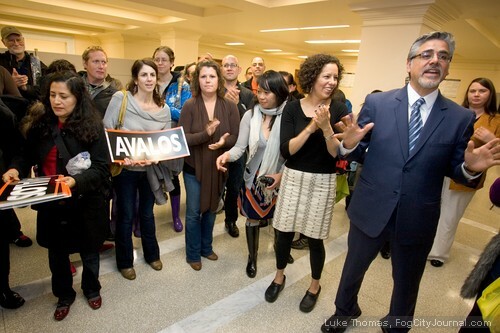 Undeterred by unrelenting downpours, dozens of high-spirited supporters attended District 11 Supervisor John Avalos’s filing of paperwork Friday at the Department of Elections, officially declaring his bid for re-election to the San Francisco Board of Supervisors. Elected to the Board of Supervisors in 2008, Avalos was joined by Assemblymember Tom Ammiano, Assessor-Recorder Phil Ting, Treasurer Jose Cisneros, Supervisors David Campos and Eric Mar, as well as union reps, community organizations and residents. Coming off a second-place finish in last year’s mayor’s race, Avalos, a progressive, said his biggest accomplishments so far includes balancing a $500 million budget deficit when he served as Chair of the Budget and Finance Committee, restoring funding to critical services cut by then-Mayor Gavin Newsom; sponsoring and passing the city’s first local hire ordinance; and organizing with community groups in his District around efforts to improve services for senior citizens and youth, as well as helping small businesses survive in a difficult economy. 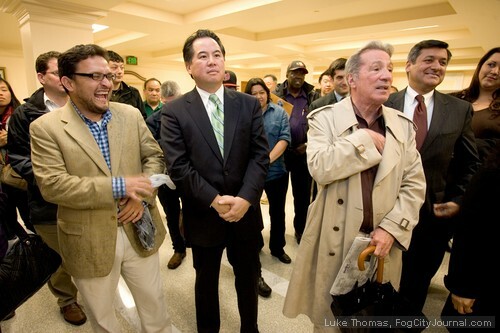 Assemblymember Tom Ammiano (second from right) with Supervisor David Campos (left), Assessor-Record Phil Ting (second from left) and Treasurer Jose Cisneros (far right). Board of Supervisors President David Chiu, who ran as a progressive and was elected to the Board in 2008 in large part with progressive support, stacked this year’s Budget and Finance Committee, which is tasked this year with closing a $165 million budget deficit, with moderate-conservative Supervisors. Though Chiu assigned Avalos to the Budget committee, he named District 4 Supervisor Carmen Chu, who was appointed to the Board by Newsom, its chair. “John has proven to be someone who is cool under pressure, someone who has a lot of responsibility and who has handed himself really well with a lot of poise and integrity, and he’s very responsive to the needs of the community, so I’m very proud to support him,” Campos added. 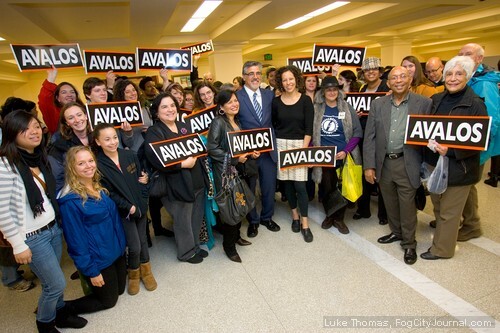 Avalos has been early endorsed by United Educators of San Francisco, SEIU 1021, and the Coleman Action Fund for Children. John Avalos signs on the dotted line officially declaring his bid for re-election. 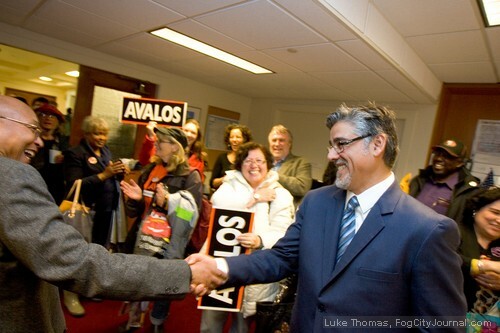 Avalos shakes hands with San Francisco Bayview newspaper publisher Willie Ratcliff. Comments for Supervisor Avalos Declares Re-Election Bid are now closed. As a District 11 candidate, he won’t have to campaign west of Stanyan. Oh – he didn’t do as a mayoral candidate, either. Love that pic’ of Willie and John. I hope we’re now going to hear more about municipal banking and maybe even a second, future mayoral run. He ran an impressive campaign. I gave Avalos one of my three ranked choice votes last fall because of his municipal bank proposal, anti-foreclosure activism, and, for one reason that was probably mine alone: there were signs that he understands the imperial evangelists’ export of the battle over LGBT rights to Africa and Uganda’s infamous Anti-Homosexuality Act, aka, Hang the Gays Bill in context. An elected in a city that leads the world in LGBT rights should.